"Fantasy in the Sky" is back over Sleeping Beauty's Castle. "Fantasy in the Sky" is back at Disneyland. The fireworks program started at the Anaheim theme park in 1958. TO EVERYTHING, A STORY: Ask a serious maven of the Magic Kingdom about the names on the windows of Main Street or how Walt Disney's Enchanted Tiki Room developed or the story behind the Sherman Brothers penning the theme to "it's a small world" and you're likely to get a full and colorful discourse on the topic. So it makes perfect sense that even those elements of Disneyland that don't seem to come bearing their own highly specific tale actually, in fact, very much do. For example? Well, if you've seen one fireworks show at the Anaheim theme park, you have not seen them all. The pyrotechnics pizzazz seen over Sleeping Beauty's Castle has its own variations and backstory, enough to fill a few fan blogs. So when a former fireworks show reappears, it is quite the huge deal among regular park attendees. AND THAT HUGE DEAL... popped and fizzed like a sparkly flower in the sky when "Fantasy in the Sky" made a grand re-entrance on Jan. 9 after saying adieu in 2004 (and only showing up on various New Year's Eves). 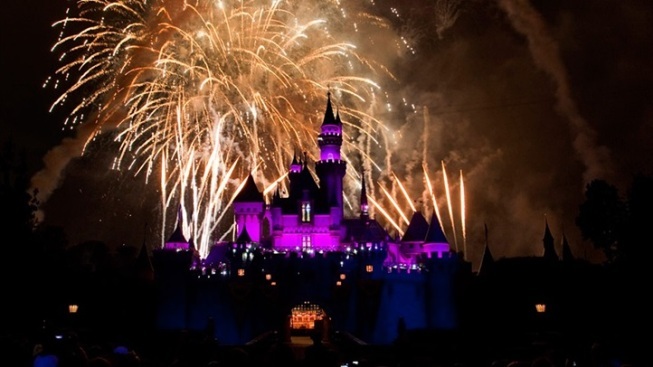 Yep, that means it is a fireworks show that has been very rarely seen at the world's most famous theme park, but its roots go even further back: It started in 1958, just a few years after Disneyland debuted, meaning it has some real cred. The soundtrack for the fireworks is "the most recent" (just in case you're listening for the sounds of 1958) and the sky show is on "for a limited time." Have you seen "Fantasy in the Sky" at Disneyland Paris or in Orlando? It has played there as well, but it has been a rarer sight in Anaheim, at least for the last decade. AS FOR FINDING THAT PERFECT SPOT... to watch? Well, everyone has an opinion on that, from a curb along Main Street to Frontierland to as close as you can possibly get to the castle. But it serves as a reminder that the park is built on the business of nostalgia, very much so, so any element you've fretted over, thinking it might be gone, could one day make a dazzler of re-debut. Did you see this fireworks program in the 1950s? Wonder if any memories of a night spent at Disneyland during its first decade will pop up as the fireworks pop above you.